Hot Dogs at Cool Prices: Happy National Hot Dog Day! 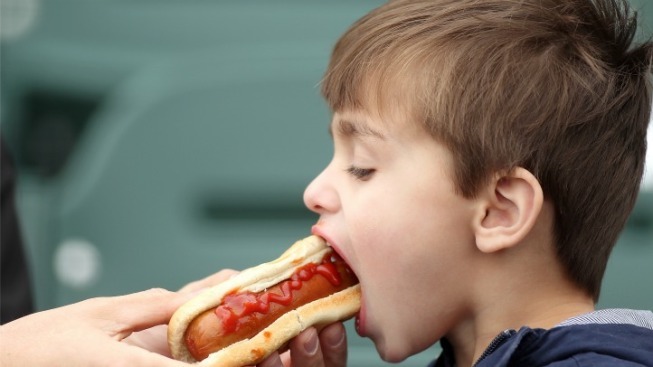 Meat lovers can rejoice in National Hot Dog Day. National Hot Dog Day is here and several food retailers are offering free, discounted or gourmet wieners to mark the occasion. Download the 7-Eleven app to get a coupon for a free 1/8 pound Big Bite. The Chili Cheese Coney or All-American hot dog is $1 all day long at Sonic. Participating Kangaroo Express locations across the south and midwest are serving up 25 cent hot dogs between 6 a.m. and 6 p.m. Those with a military I.D. can get their meaty treat for free. Hot dog-loving Chicagoans can enjoy gourmet ethnic themed hot dogs made by Chef David Blonsky at Bull & Bear, who is celebrating the sausage all week long. Check out their full menu here. For Ruby's Bar & Grill, it's hot dog day everyday. The New York City bar has been surving up free hot dogs for over 25 years. The Imagine Nation Museum in Bristol, Conn., is helping kids get in on the fun with games and hot dogs between 11 a.m. to 1 p.m.
A recent round-up of the country's best hot dogs includes a foie gras and sauternes duck sausage with a truffle aioli from Chicago's Hot Doug's and the garlicky Sabrett hot dog from Katz Delicatessen in New York City. Not in the mood for encased meat? Arby's is celebrating their 49th anniversary on the same day and will be offering their Roast Beef Classic Sandwich for the throwback price of 64 cents.